We all know someone who had hinted that they are interested in flying GA airplanes. It might be someone at work, it might be your son or daughter. Usually, they can be easily spotted in a crowd because as you blab on endlessly about airplanes and flying – after the rest of the crowd has vanished – these "wannabes" are still there hanging on your every word about greased landings, ILS approaches, Oshkosh and sneaking into Sun River for a weekend of play time. After months or sometimes years of trying to figure out the best approach to getting a pilot's license, many new flight students seem to make a few wrong decisions that come back to bite them in the backside later on. Maybe it's choosing the wrong flight school, or the wrong flight instructor, or maybe it's choosing to learn behind a standard six pack of steam gauges when you KNOW you really want to fly only glass cockpit machines. These decisions wouldn't be so tough – you say to yourself – if only you had read the manual first. "Garmin G1000 expert and author Max Trescott was named the 2008 National Certificated Flight Instructor of the Year by the General Aviation Awards Program. 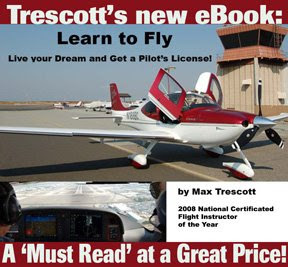 Perhaps best known for his Max Trescott's G1000 Glass Cockpit Handbook, he is a Master CFI and Master Ground Instructor and teaches flying at the Palo Alto, Calif. airport. 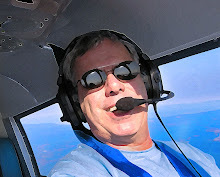 He is now a factory trained Cessna FITS instructor, a Cirrus Design CSIP, a Columbia (Cessna) 350 / 400 instructor, and teaches in the national Columbia recurrent training program." What Can I do with my Pilot Certificate? What Kind of Planes Can I Fly? How Far Can I Fly? What Does It take to Get a Pilot’s Certificate? Do I Need to Take a Ground School? Can I Earn a Living Flying? Max's blog [found here] is also a must-read for flight students, with posts such as "Zen and the Art of Instrument Flying" sure to generate deep thinking. Best to read that one while in some sort of Yoga pose. It is not often that we get free info from someone at the top of their profession. Why Max is not charging $29.95 and including a free set of Ginsu knives for each eBook is beyond me. But in a world where big name CEOs and celebrity chefs aim to rake in the dough by the very mention of their names, it is refreshing to find an aviator like Max Trescott who has his ego planted firmly on the ground. For that one reason alone, I think everyone who reads this post ought to go here and download Max's eBook and promise to pass it along to anyone in their address book who has even a remote attraction to flying machines. Do it for the good of GA, because if you introduce the eBook to someone and they end up as a lifelong pilot, you will have become one of GA's heroes – a person that has done something substantial to help solidify the future of private aviation in this country. And trust me when I say, GA needs a few heroes right about now.